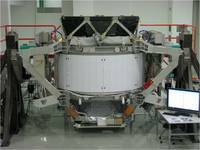 One of the most exciting scientific instruments ever built, the Alpha Magnetic Spectrometer (AMS), arrived at ESA’s Test Centre in the Netherlands for testing before being launched on the Space Shuttle to the ISS this July. The quest for the origins of the Universe is about to take a step further in the Large Space Simulator (LSS) at ESA’s research and technology centre, ESTEC, in Noordwijk, the Netherlands, under responsibility of Agency's Directorate of Human Spaceflight. The LSS is used to test satellites and spacecraft before they are sent to space and has seen all kinds of space hardware, but the AMS detector is still very special. Not only is it the biggest scientific instrument to be installed on the International Space Station (ISS), but also it is the first magnetic spectrometer to be flown in space, and the largest cryogenically cooled superconducting magnet ever used in space. AMS will help scientists to understand better the fundamental issues on the origin and structure of the Universe by observing 'antimatter' and 'dark matter'. As a byproduct, AMS will gather a lot of other information from cosmic radiation sources such as stars and galaxies millions of light years from our home galaxy. Not only astronomers, but also particle physicists are waiting for AMS data. The AMS project is led by Nobel laureate Samuel Ting, from the Massachusetts Institute of Technology (MIT), and involves an international team composed of 56 institutes from 16 countries. ESA is a partner in the AMS collaboration through the Directorate of Human Spaceflight. The first version of the experiment, AMS-01, was flown in June 1998 aboard the Space Shuttle Discovery and, after promising results, the bigger and more capable version was accepted to be flown on the ISS. The AMS detector was integrated at the European Organisation for Nuclear Research (CERN) in Geneva, Switzerland. The first part of the tests was also conducted at CERN, when the detector was put through its paces using a proton beam from CERN’s Super Proton Synchrotron accelerator to check its momentum resolution and its ability to measure particle curvature and momentum. AMS’s ability to distinguish electrons from protons was also tested. This is very important for the measurement of cosmic rays, 90% of which are protons and constitute a natural background for other signals that interest scientists. AMS will be looking for an abundance of positrons and electrons from space, one of the possible markers for dark matter. With over 300 000 data channels, the detector gathers an extremely large amount of data, which is then processed and sent back to Earth using the ISS power, communication and data infrastructure. After a six-day journey from Geneva to Noordwijk, the special convoy rolled into the LSS building accompanied by 20 members of the AMS collaboration team. The LSS uses a huge vacuum chamber, complete with its own bright 'Sun' and walls cooled by liquid helium, to reproduce closely the conditions of space, while various shakers, acoustic chambers and electromagnetic tests are used to mimic conditions during launch and operation in space. The test objects will be treated at least as hard as they would be during launch or in space. "I just saw masterpieces of European technology taking off and being installed on board the ISS as I attended the launch and follow the mission of the Space Shuttle Endeavour with Node-3 and Cupola," said Simonetta Di Pippo, ESA Director of Human Spaceflight. "For all AMS represents to me as a physicist, with a responsibility for human spaceflight in Europe and as a European citizen, I couldn’t wait to see it coming through the ESTEC gate. It will be exciting to see it undergo testing and then head towards Kennedy Space Center to find its place on the Shuttle and later on the ISS." Once the extensive testing is complete, AMS will leave ESTEC at the end of May on a special US Air Force flight to Kennedy Space Center in Florida. It will be launched to the ISS on the Space Shuttle Endeavour on flight STS-134, now scheduled for July. "Europe contributed to a large extent to the design and development of AMS and the mission will be even more special to Europeans because ESA astronaut Roberto Vittori will be flying with AMS on a flight opportunity from ASI," concluded Di Pippo. "We are going through exciting moments and we move from one accomplishment to another. This is the best way to pave the way to the ISS extended operations through 2020 and beyond."